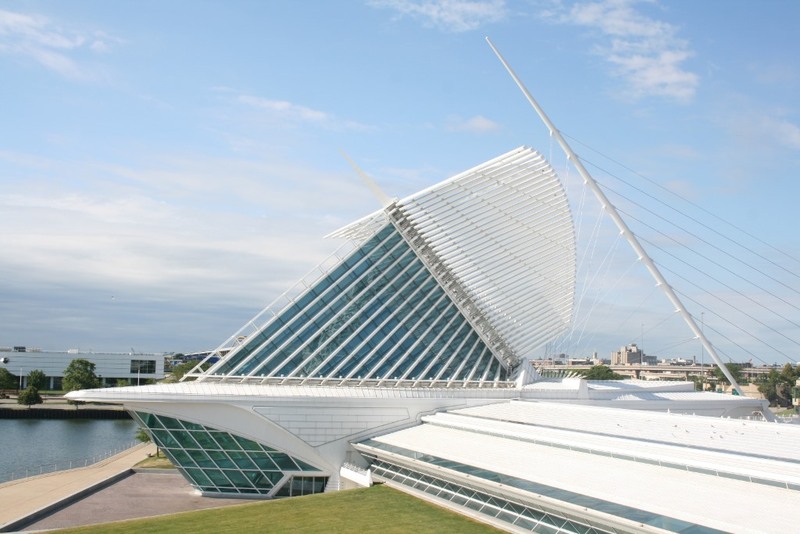 When I visit the Milwaukee Art Museum, I time the visit to include lunch at Café Calatrava. That’s not hard to do as it’s easy to arrive at 10:00, then spend hours wandering around our wonderful museum, lost in a collection which spans centuries. I often start my tour with coffee and a pastry at Windhover Coffee where I can ogle the Chihuly sculpture, everyone’s favorite, which dominates the main entrance. After two or three hours, or when hunger strikes, I head downstairs to Café Calatrava for lunch. With floor-to-ceiling windows facing Lake Michigan, this space has a bright airy contemporary vibe which feels inviting. At a recent visit, three friends and I notice the patio and long for summer outdoor dining. 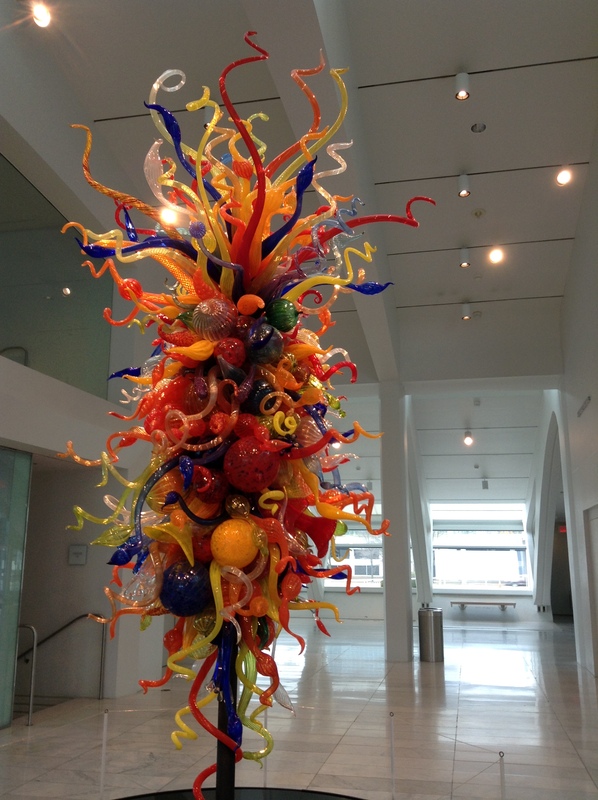 Chihuly sculpture. Photo by Cari Taylor-Carlson. 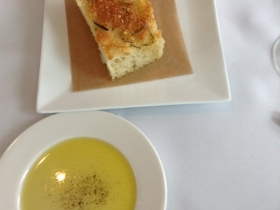 Lunch starts with four slices of house-made rosemary foccacia topped with grated parmesan. It’s accompanied by a plate of olive oil, a yummy dipping sauce for the warm bread served on a warm plate. The light bread has a crunchy crust from the parmesan, and because it just exited the oven, we taste and smell the yeast. Our lunch choices are equally impressive. The Daily Special, Meatball Flatbread looks like a baby pizza, just enough for one. 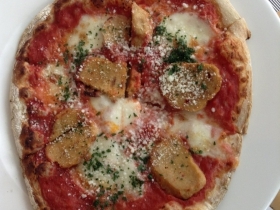 The irregular shaped crisp crust, also yeasty, holds thick slabs of Nonna’s meatballs, several dollops of fior di latte mozzarella cheese, and a pomodoro sauce with a spicy bite. Finely chopped basil decorates the pizza topping and completes the flavors of the dish which raises the bar for all flatbreads in my future. A companion orders Nonna’s Meatballs from the Starters and says, “They’re wonderful, so tender and light they must be made with veal.” I agree after share some bites. But no, those surprisingly tender meatballs are actually made with Maple Creek Farms pork shoulder. 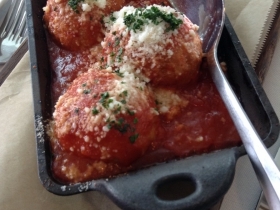 Our server checks with the chef and says, “They use breadcrumbs soaked in milk to make them tender.” They serve the meatballs in a cast iron dish in a puddle of that spicy pomodoro sauce, topped with finely grated pecorino and chopped basil. 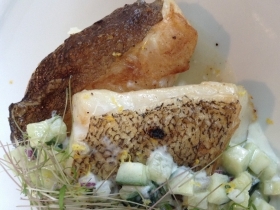 Roasted Cod, two pieces with crisp skin, come with lemon mashed potatoes and cucumber salad. “The baked cod,” says my companion “tastes really fresh.” She adds, “This is a lot of cod.” The side salad with yogurt dressing, cucumber, and red onion adds crunch, texture, and flavor to a dish that might have been bland or at least lacking in color and texture. Another person at our table finds a minor glitch in the Blood Orange and Goat Cheese Salad. 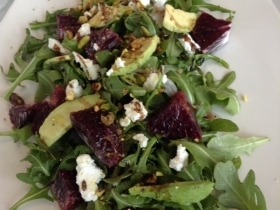 The salad, mainly arugula, has an ample supply of blood orange and avocado, and enough pistachios, but was missing the fennel she had read on the menu. She mentions this detail to our server who goes to the kitchen and returns with a dish of sliced fennel to complete her salad. We leave four empty plates and continue to the dessert menu where we order Meyer Lemon Pound Cake and Birramisu. 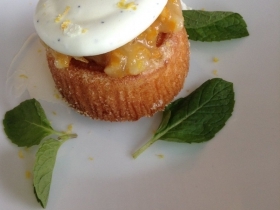 The cake, served with mascarpone cheese, is a little dry but my companion says, “The lemon marmalade makes the dessert. The dry cake needs the moist tart lemon to bring it to life.” On top of the marmalade, a meringue crust gives it a nice crunch, though it’s more like a separate cookie perched on the cake. The Birramisu, a Milwaukee twist on tiramisu tastes slightly of the Sprecher Russian Imperial Stout which the chef uses to make the dessert. It has the usual components, lady fingers, mascapone, and a dusting of unsweetened cocoa powder. It’s served with a drizzle of chocolate sauce, which makes a pretty plate and complements the beer-infused dessert. We wish it had been a puddle, not a drizzle. No one in this group eats much meat, but when we read the description for the Sconnie Cheese Burger made with short ribs, brisket, and sirloin, topped with American cheese, smoked bacon, dijonaise, and melted onions, we decide to put that on a bucket list for a future visit. Since I wrote this review, Chef Jason Gorman has taken a position as Culinary Director at the Ambassador Hotel. I wish him well. He will be missed at Café Calatrava. But it’s a lovely venue, and may attract another fine chef. Location: 700 N. Art Museum Dr. I like dining at Callatrava too, and felt badly when I read, at the end of your review, that chef Jason Gorman has left. Do you know who the new chef will be?